I'm not sure how we fit all of our past four day events into our schedule. 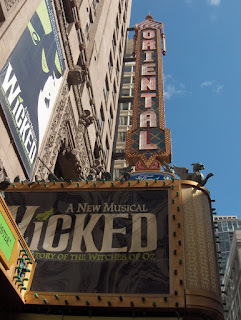 On Wednesday we headed to Chicago to see Wicked. It was the first time any of us had seen a professional group perform live on stage. We were in awe of the entire production and hope to hit a show in Chicago(unless my plan to move out of Illinois succeeds) once per year until the kids are out of the house. 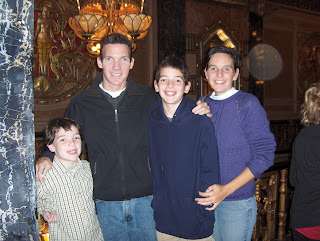 On Thursday my eldest turned 12. Wow, Just a year away from being a teenager. Time flies! Friday the kids and I headed to Legoland in Schaumburg. We agreed the best part was the "mini" Chicago. 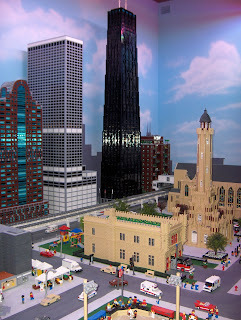 Having just walked around town they were excited to see the same buildings recreated in Legos. 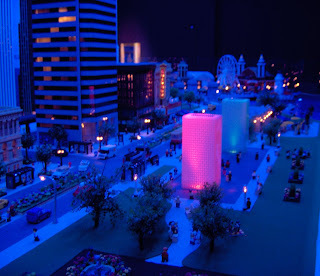 Every few minutes the scenery turns to nighttime and the fountains and buildings light up, the passengers at Navy Pier even have flashes go off on their Lego cameras. We enjoyed the little details including the batman at the top of the Sears Tower. Then on Saturday, we headed back to Chicago for Yarn Con. It was great to meet with Franklin Habit, Jen from Piddleloop, local DeKalb Etsyian Beth, and even had both Mason Dixon Knitting books signed by Ann. When we arrived back home we met up with a potential furry buddy for our dog Baxter. The new dog had just arrived into the States from Puerto Rico and was a bit scared of our crazy pup. I was too afraid that Baxter would end up playing too rough with the little guy so I decided to keep looking for a better match. It will be a breath of fresh air to stay local this week after our adventures. It sure is nice to have so many opportunities of the "big" city just a train ride away! 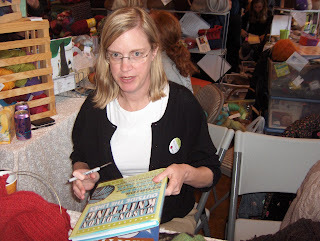 That looks like such fun -- I would have loved to go to Yarn Con!! Thanks for getting my bag I ordered sent out so quick! !